Keep lit cigarettes and all other flames or sparks away from the battery. The battery contains hydrogen -- a highly combustible gas which will explode if it comes in contact with a flame or spark. Keep batteries out of the reach of children because batteries contain highly corrosive SULFURIC ACID and electrolytes. Do not allow battery acid to contact your skin, eyes, clothing or paint finish. The battery contains lead. Do not dispose of it after use. Please return the battery to an authorized Kia dealer to be recycled. When the vehicle remains unused for a long time while tempertures are low, disconnect the battery and keep it indasrs. 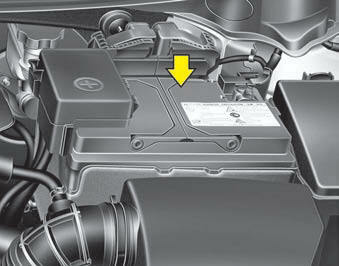 Never touch the electrical ignition system while the vehicle is running. This system works with high voltage which can "zap" you. Disconnect the battery charger in the following order. Turn off the battery charger main switch. Unhook the negative clamp from the negative battery terminal. Unhook the positive clamp from the positive battery terminal.